It’s the holiday season and I am reminded of my childhood living near Pittsburgh, PA (Go Steelers!!) where this time of year meant snow. Snow… the very word conjures up pictures from the greeting cards and commercials. There’s nothing like the pure driven snow. It looks so beautiful evenly placed over the ground... covering up the bumpy imperfections of the earth beneath it. Pure white flakes delicately balanced 1 or 2 inches high on each individual tree branch. It’s so majestic. What we sometimes forget from the perspective of these images is that it’s FREEZING out there! If we want to go outside, we have to spend 20 minutes putting on 6 layers of clothes and big boots to look like the Michelin man as we try to make our way to the car. Getting to the car is just the beginning of the battle. Then you have to try to open the door that Mother Nature has so kindly iced shut in the frigid wind. Once you make your way in, you start up the car because it’ll take a few minutes before it’s ready to go. Then, you step back out into the frozen tundra with your handy-dandy piece of plastic (otherwise known as your ice scraper). Sometimes the snow is so deep that you have to remove some of it with your arm, but then the scraping begins. You debate, as your toes, nose and fingers start to become numb whether or not you’ll just scrape the driver’s side or the whole windshield. You clear one square foot in front of the driver before your plastic scraper freezes and disintegrates. So you take off your gloves, reach into your wallet for the credit card that you use the least, and try to make the area bigger before returning to the less freezing environment of your car. Oh, the beauty and majesty of the season! I tell you this story because the illusions of Christmas and the holidays can be just as stressful as freeing your car of the “beautiful, splendid snow”. Hallmark and other institutions have forever painted our holiday season with joy and happiness and gifts. We’re all getting that Lexus with a big red bow this year, right? The family will get together and all sit around the 12 person dinner table flawlessly decorated with placemats and red and green napkins.The patriarch of the family is standing at the head of the table carving the turkey or ham. The matriarch is passing around the perfectly prepared side dishes… mashed potatoes with un-lumpy gravy, green bean casserole with the crunchy onions on top, and homemade cheese raviolis (my mom’s Italian, ya know). 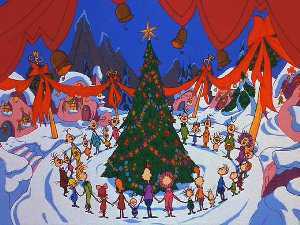 They’ll all hold hands and sway as they sing grace just like the Whos in Whoville. Then they will tuck in their napkins and politely converse over the holiday meal. Oh, the joy and happiness!